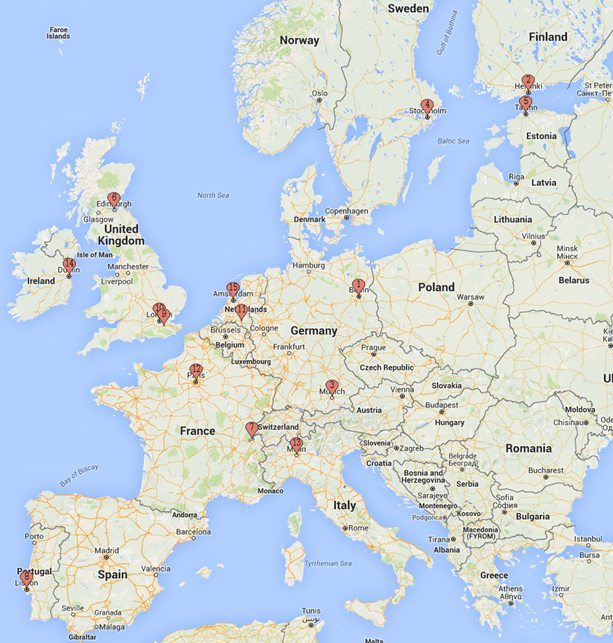 What are the best tech hubs in Europe right now? If you haven't been living under a rock, you will have heard that the United Kingdom is going to leave the European Union. This will likely have consequences for the Silicon Roundabout, since it relies very much on skilled developers from the rest of Europe. On the other hand, both Berlin and Paris have been pitching to developers and start ups to come and work there. As a remote worker, I have the option of working from wherever I have a stable internet connection. My colleagues hail from 4 different continents. I help tutor talented developers living in Nigeria. For my job, in the most part, where I live does not matter. On the other hand, I would like to maximize my salary, my happiness and be in a safe place where the national health service is great, for example. Also, I want to live in a tech hub, because that's the best guarantee I can find another job if I ever lose this one. I've been doing this the geek way. Firstly I got a list of European tech hubs from GigaOm, I've cleaned it up a bit, I've added all the places where I've lived (Sevenoaks, Milan, Lisbon, Singapore and Paris) for comparison purposes. I got a list of sixteen cities I will be comparing. Here's what I got on a map so we can see where they are (Singapore removed because it's too far). Then I looked up the cost of living, healthcare perception and happiness index. I've looked up what percentage of voters vote for far-right or right-populist parties (both because I don't like those ideologies and because they threaten my rights as an immigrant). I've checked the price of 3 economy tickets from there to Milan (to go and visit my family and relatives). Finally I've considered where they need a visa -- a visa is generally a non-insignificant cost to immigrants. Finally, I've tried to derive what my monthly net salary would look like. This is based on an online tool which doesn't really satisfy me... but I'll use it as a proxy variable until I can do better. The final index is calculated using the following formula. From the net monthly salary, I remove 100£ if I have to care about a visa -- both as a penalty and as an actual cost. I further remove the cost of 2 round trips home for my family of 3, per year (so 1 round trip is divided by six). I divide the remaining salary by the cost of living to obtain an index that determines my purchase power, in other words how "rich" I am in that city. Being rich is great, but so is being healthy, or happy, or safe. Multiplication of these values highly favors countries where they are all high, and disfavors countries which have extremes (e.g. very high purchase power but low health). Another thing I've considered is that happiness is not as important as unhappiness. Not living in a pessimistic country is much more important than living in a happy country. Therefore I've calculated an "unhappiness index" by subtracting happiness from 10, and then divided by it instead of multiplying. This is of course an imaginary index, however I find it is quite realistic as all these indexes seem to empirically relate to each other and the formula reinforces this correlation. The top 5 tech hubs are Berlin, Helsinki, Munich, Stockholm and Tallinn. The top 4 are great all-rounders in all the indices. Tallinn is not a place where people are that happy, but it's great value for money, since purchase power is about twice than Sevenoaks. The great disappointments are Dublin and Amsterdam. Dublin is let down by poor health care and taxes a little higher than most. Amsterdam has high taxes, OK health care and 10% of right wing extremism which lets it down. Finally, by looking at all the places I've lived, I agree with this order, Singapore being the place where I've been the happiest and Milan the least happy. I have had a lot of fun doing this experiment, and I feel that it has given me insight in all the possibilities I have being a remote worker at Stack Overflow. I was ready to give up on the Nordic countries due to a perception that I could not afford them, but they turn out to be among the best choices. Of course, this result is just an indication. Next we're going to compare some houses we could afford to rent in the top five cities and compare with where we live. Nothing is more convincing than a picture of a house where you can see yourself living and spending a few years! We can say that Mr. Robot is having a moment. The main character was one of the top choices and thus is perhaps the most/least realistic/annoying/inspiring portrayal of what it’s like to be a computer programmer today.